Rugoconites enigmaticus is a dome-shaped fossil, with birfurcating ridges that radiate from its centre. Rugoconites was originally interpreted as an ancient medusoid (jellyfish). Subsequent descriptions have compared the tri-radial fossil with sponges (porifera) (Gehling & Rigby, 1996), however its classification is still uncertain. Jenkins, R.J.F., 1992. 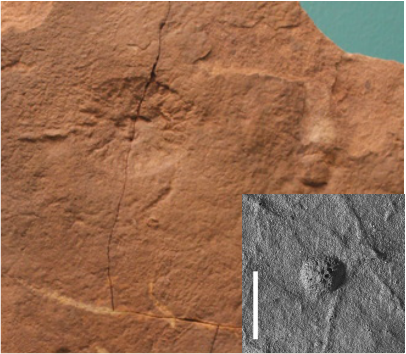 Functional and Ecological aspects of Ediacaran Assemblages. In Origin and Early evolution of the Metazoa. Lipps, J.H. & Signor, P.W., eds, New York, Plenum Press, 131-176. Large Rugoconites specimen approx. 5 cm in diameter. Photographed at the South Australian Museum. Image: Dr Alex Liu. Small Rugoconites specimen (inset) from the South Australian Museum, P49388. Scale bar = 1 cm. Modified from Coutts et al. (2016). Periphery circular to oval. A few radial ridges diverge from a small central elevation or polygonal ridge, and branch dichotomously one to three times. The last dichotomy is, in each individual, a constant distance inside the periphery, and the resultant ridges curve slightly to meet the periphery at a right angle. The fossil Rugoconites tenuirugosus is similar to R. enigmaticus, although it appears to be much flatter, and its radial ridges are finer and more numerous. Rugoconites with very fine radial furrows which branch dichotomously about 3-5 times, diverging at a very low angle and tending to curve parallel; reticulations rare to common in different individuals; furrows reach smooth central area (?stomach).